Having colleagues all over the world means I get access to all sorts of regional sweets, which is just lovely. Last week Mari, from Japan, brought me some of her local faves and these Quattro’s looked like some of the more unique ones of the bunch. These are very aromatic as I open the individual package. Floral green tea wafts strongly from such a small piece, and it wreaks of decadence. Only about 1.5″ long with 4 layers that don’t pile up to more than a half inch high, these may be small for a reason. These are rich, though not the bad kind of ‘rich’ – these have a deepness, more than a heaviness. The green tea taste is awesome, thanks to the matcha. Just like green tea ice cream, which I love. The liquid in the middle is a great addition, with its very strong and sweet liqueur… it even seems it might have a dash of real alcohol in there. The small liquid amount is the right amount because it adds to the overall experience really nicely without being overbearing. And it ain’t like the semi-novelty liqueured chocolate mini bottles, which drips with the liquid. This is much more low-key and more goo-like. Mrs. Guru felt these were artificial tasting. I generally disagree, but these DO have that Japanese perfection thing going on. You know, the sort of strangely staid, sanitized feel that Japanese packaged foods have? But I like that. And in general, I like these a lot. 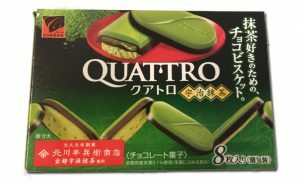 Maybe because I’m just so used to the American candies and European gummies, but these Quattro’s are original, tasty and just the right size. 1) Quattro is ITALIAN for “four” not Spanish. 2) “I know these Quattros have four man parts” — um, GROSS. Can’t believe you didn’t spend more time here. What man parts? The bait and tackle? The twigs and berries? Again, GROSS. 3) Is matcha the same as mochi? These look kind of good. Quatro is 4 in Spanish though. So they misspelled the spanish. Tough they finished all the packaging before realizing the mistake. The parts are ‘sections.’ As you can see in the image. Matcha is green tea. Mochi is ice cream. I don’t say this about many of our readers, but you sir, are a dingbat. So I changed the title just to be sure I didn’t get more “I’M BETTER THAN YOU” hate mail. It’s like all Trump up in here. Mochi is not ice cream.Its a rice cake made of japanese glutinous rice. Thanks, Pandora. Abso correct. Mochi is the rice cake, paste-like-almost sticky pastry thing that goes around the ice cream. In the US, where I live, when you order “mochi” at a restaurant or buy it in a store you get balls of ice cream covered in the rice cake. Looking forward to find this ones.